Isn’t he handsome? He has a very sweet personality, great horns, good color percentage and the best part – no destructive behavior 😉 I had so much fun making him! 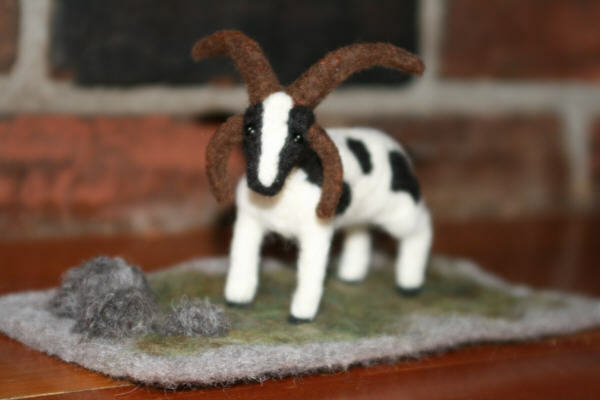 I was inspired by a couple felting sites – www.woolpets.com and www.feltpets.com – I have been browsing the internet for felting ideas because my goal for 2009 is to open a little fiber shop on our farm! We have the perfect little building for it. It has one main room with a little kitchen, bedroom, and bathroom. I have been using it for fiber storage and had plans for opening a fiber shop, but was overwhelmed with how to go forward. Over the weekend the idea came to me to teach felting classes! My concern with opening a fiber shop was how was I going to get customers? I am going to start small, but I have big plans and have found a couple lines of products that I would like to sell. My brother came over on Saturday and helped me brainstorm and layout areas for shelves and a big work table. The table is going to be reversible for wet felting on one side and dry felting on the other. A couple ideas for classes are – 3D felting (like Ramsey), flat needle felting (like my wall hangings), and wet felting (like my scarves). I am really excited now that I have a plan and am moving forward 🙂 I’ll keep you updated on how the little house is transforming and when you can sign up for classes! Very, very , nice needle felting. I have done a little and plan on really getting down to getting better at the art this year. If I lived closer I would sign up for classes. Good for you too, to just go for it. I am trying to work up the boldness and self-confidence required to go forth with some long held goals…and encouraged to see you do it! You left a comment on electric fencing for a possible solution for ram control, I have tried it and it doesn’t work Three strands of electric fencing did not stop a whole flock of walking right through it. A flock of wet and sheared sheep , which means they did not have the insulating coat to prevent shock. Wish it did work. If our ram gets too much more destructive he will be at the taxidermist’s! I love Ramsey! He’s just so cute! I learned how to needle felt over the Christmas holiday and made some ornaments. I had the most trouble making the legs for animals. Do you use wire in the legs? If you have any tips, I’d love to hear them. If I was closer I would take your classes but I’m a bit far for that! Wonderful! Can’t wait to read about the progress on your shop.